Urdiales, C.; Peula, J.; Barrue, C.; Cortes, U.; Sandoval, F.; Caltagirone, C.; Annicchiarico, R.
In this paper we propose a system where machine and human cooperate at every situation via a reactive emergent behavior, so that the person is always in charge of his/her own motion. Our approach relies on locally evaluating the performance of the human and the wheelchair for each given situation. Then, both their motion commands are weighted according to those efficiencies and combined in a reactive way. This approach benefits from the advantages of typical reactive behaviors to combine different sources of information in a simple, seamless way into an emergent trajectory. Urdiales, C. [et al.]. 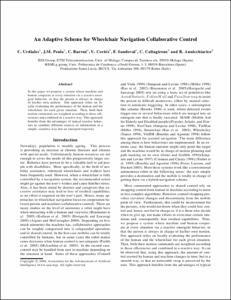 An adaptive scheme for wheelchair navigation collaborative control. A: AAAI Fall Symosium 2008. "AI in Eldercare: Papers from the AAAI Fall Symposium". Arlington: AAAI Press. Association for the Advancement of Artificial Intelligence, 2008, p. 1-8.